An iPhone with No Phone: Big news! 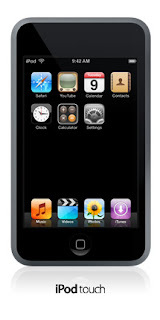 To go with Apple’s annual tradition, Steve Jobs introduced a new iPod line named “iPodTouch”. I’m not kidding and you are definitely not dreaming. It does look like an iPhone but actually a fraction smaller and slightly thinner than the iPhone. Most of its multimedia features are identical to that of the iPhone, but it is the first iPod ever that has internet capability with its Safari browser via wi-fi. Its multi-touch screen’s size is same as the iPhone but it comes with 8GB and 16GB storage models to choose from. Some other features of this new iPod are not that spectacular as I have already heard about it on the iPhone. It’s basically iPhone, iPhone, iPhone, but with no phone functionality. Other important products that Steve have announced today are new line-ups of iPod Nano and iPod Video which he appropriately called the iPod Classic because as he said, “it is the original iPod”; makes sense hehe. I love their new design (click on the images below for a larger view). It looked fatter but the metal enclosure is sleek. The new Nano, with 4GB and 8GB models can now play video on its 2-inch screen. Meanwhile, the iPod Video now has a 160GB model and has a much improved battery life (that’s what Mr. Jobs said). The screen size is still the same as the older 5th generation models but the new one has a new UI (User Interface). If you already have an iPhone and wanted to buy a new iPod, don’t buy iPodTouch. I would recommend buying the new Nano or the Classic model. If you don’t have an iPhone and an iPod and planning to buy an iPod, please don’t buy iPodTouch. Just buy an iPhone, it is a phone with iPod + ability. For Filipinos wanting to buy an iPodTouch, just say no. Wait for the iPhone which is coming early next year with surely affordable prices. But if you lack patience, just buy a Nano today. Visit www.apple.com for more product info. Do you know the prices of these new apple product? Please visit Apple's website for more details.